EZ-On Grid Cover Kit is rated 4.6 out of 5 by 5. 1 in. x 24 in. 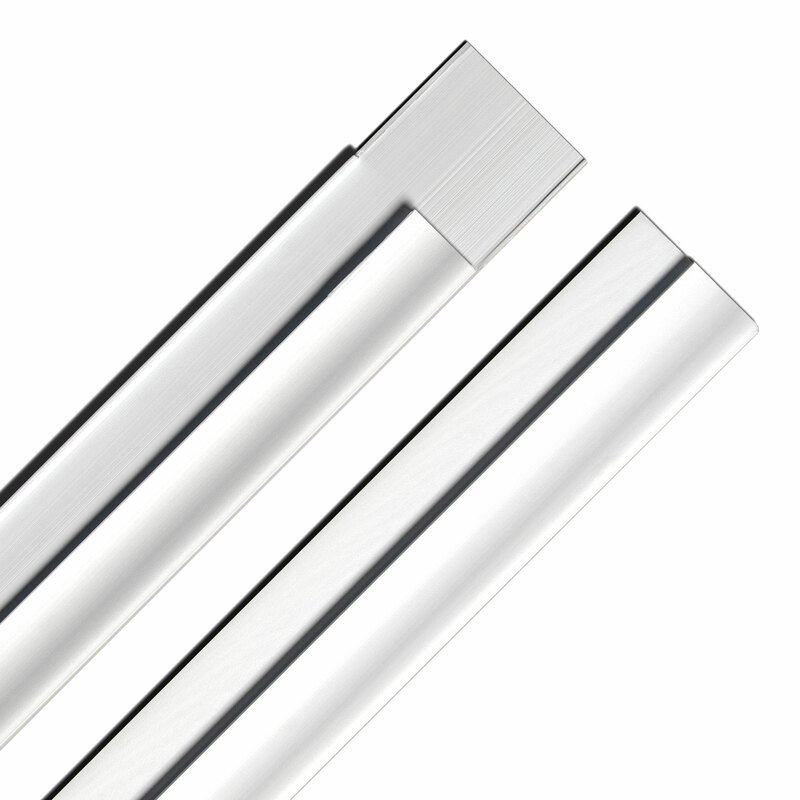 EZ-On Drop Ceiling Grid Covers are exactly what their name implies - the easiest way to make your old standard (15/16 in. to 1 in.) grid look like new. Made from 100% recyclable rigid vinyl, they color match all of Ceilume's white ceiling tiles, slide-on easily over clean or dirty grid, and require no special tools or adhesive to install. Main Covers install along your suspended ceiling's main beams and cross T's (basically every section that doesn't run along a wall). They have a tab at one end to cover grid intersections and a lip that allows the cover to "click" into place. Wall Angle Covers install everywhere your grid runs along a wall. They slide easily onto your wall angle and are pre-cut to fit 2ft. x 2 ft. grid sections perfectly. Trim with scissors as needed in corners, and use three pieces for 2 ft. x 4 ft. sections. Please note: The number of wall and main pieces varies according to the length, width, and shape of your ceiling. On average, a kit covers about 53 sq. ft. of grid. You can use our ceiling calculator to find out exactly how many pieces you'll need for your specific installation. Rated 5 out of 5 by daddyof5 from Grid Cover Kit! Ceilume Ceiling Tiles EZ on Grid Cover Kit worked great in my outside shop. The new ceiling looks like it was professionally installed but actually it was a DIY project. 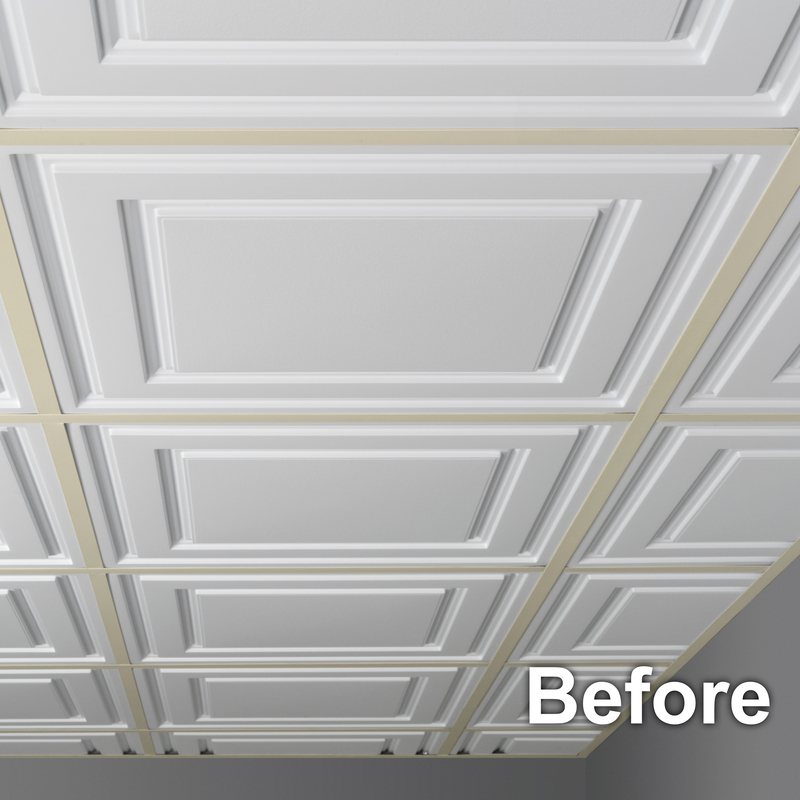 These Ceiling Tiles are Easy to install and very economical. Anyone interested in an easy DIY project capability in them can easily install and make it look great! Rated 4 out of 5 by Sheg from Easy to install We recently were updating our drop ceiling in the basement and I used the EZ-On Grid Cover Kit. I was pleasantly surprised at how easy it was to install on my ceiling. It is a simple click and go, they are up that easily. I highly recommend for any diy home improvement project where you are redoing your ceiling. Rated 5 out of 5 by Nannette from Easy to install and use I received this product in exchange for a review. These were very easy to install and look professional. We installed these at the bottom of our foyer in our basement and it adds a very nice touch. 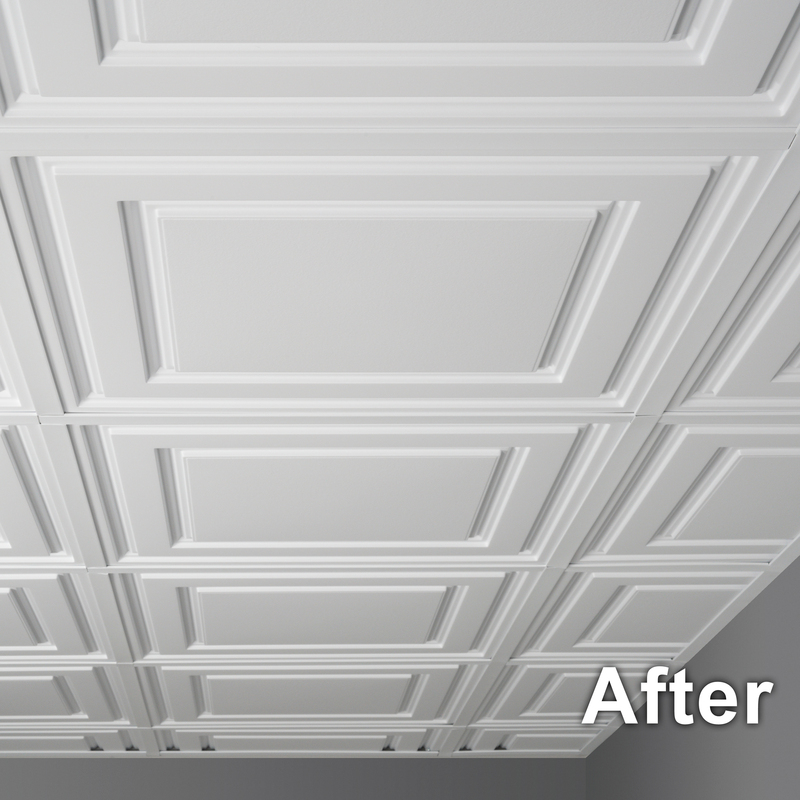 Rated 5 out of 5 by fluffy from ez- on grid cover kit this ez- on grid cover kit for ceiling tiles is great. easy too use. i used it in the closet and my closet looks great. Rated 4 out of 5 by Clm31752 from Easy This grid cover was very easy to install and looked great.